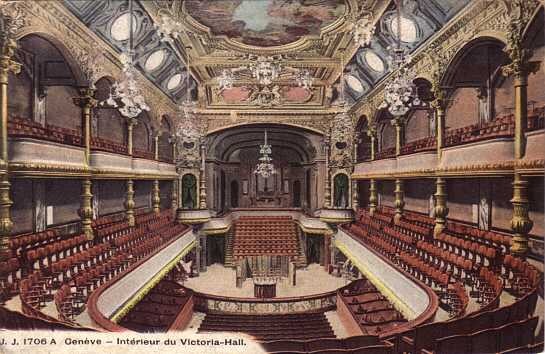 Concert hall, built 1891-1894 by John Camoletti for the the British Consul in Genève, Daniel Fitzgerald Packenham Barton. Named in honour of the British sovereign, Queen Victoria. 1904 donated to the city of Genève. Damaged by a fire in 1984. Subsequently restored. Home to the "Orchestre de la Suisse Romande". Used for classical, jazz and pop concerts. 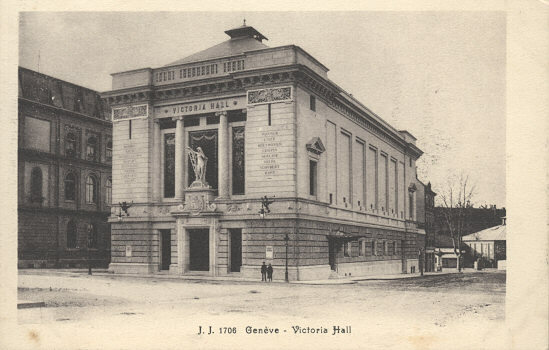 Front Text: "Genève, Victoria Hall"; inscription: "Victoria Hall"
Front Text: "Genève, Intérieur du Victoria Hall"